1800-France is a guide to travel and living in France. The numbers before the department are the official code and can be seen on car registration plates and postcodes. The capital city of a departement is called the prefecture. 01-Ain; 02-Aisne; 03-Allier; 04-Alpes-de-Haute-Provence; 05-Hautes-Alpes; 06-Alpes-Maritimes; 07-Ardeche; 08-Ardennes; 09-Ariege; 10-Aube; 11-Aude; 12-Aveyron; 13-Bouches-du-Rhone; 14-Calvados; 15-Cantal; 16-Charente; 17-Charente-Maritime; 18-Cher; 19-Correze; 2A-Corse-du-Sud; 2B-Haute-Corse; 21-Cote-dOr; 22-Cotes-dArmor; 23-Creuse; 24-Dordogne; 25-Doubs; 26-Drome; 27-Eure; 28-Eure-et-Loir; 29-Finistere; 30-Gard; 31-Haute-Garonne; 32-Gers; 33-Gironde; 34-Herault; 35-Ille-et-Vilaine; 36-Indre; 37-Indre-et-Loire; 38-Isere; 39-Jura; 40-Landes; 41-Loir-et-Cher; 42-Loire; 43-Haute-Loire; 44-Loire-Atlantique; 45-Loiret; 46-Lot; 47-Lot-et-Garonne; 48-Lozere; 49-Maine-et-Loire; 50-Manche; 51-Marne; 52-Haute-Marne; 53-Mayenne; 54-Meurthe-et-Moselle; 55-Meuse; 56-Morbihan; 57-Moselle; 58-Nievre; 59-Nord; 60-Oise; 61-Orne; 62-Pas-de-Calais; 63-Puy-de-Dome; 64-Pyrenees-Atlantiques; 65-Hautes-Pyrenees; 66-Pyrenees-Orientales; 67-Bas-Rhin; 68-Haut-Rhin; 69-Rhone; 70-Haute-Saone; 71-Saone-et-Loire; 72-Sarthe; 73-Savoie; 74-Haute-Savoie; 75-Ville-de-Paris; 76-Seine-Maritime; 77-Seine-et-Marne; 78-Yvelines; 79-Deux-Sevres; 80-Somme; 81-Tarn; 82-Tarn-et-Garonne; 83-Var; 84-Vaucluse; 85-Vendee; 86-Vienne; 87-Haute-Vienne; 88-Vosges; 89-Yonne; 90-Territoire de Belfort; 91-Essonne; 92-Hauts-de-Seine; 93-Seine-Saint-Denis; 94-Val-de-Marne; 95-Val-dOise. 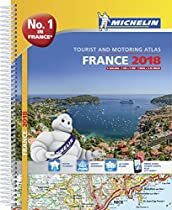 The yellow local maps by Michelin are the best maps to have to discover the departmental roads, scenic routes and beautiful villages of rural France. It's better to have two or three of these, if you're travelling extensively in France, than to rely on a more general map of France. I also update my copy of the Michelin Road Atlas every few years. Some of the original regions reused the names of traditional French provinces, although geographical borders may have differed from those of the provinces. On 1st January, 2016 France reduced the number of metropolitan regions from twenty-two down to thirteen. Countries neighbouring France are: Belgium, Luxembourg, Germany, Switzerland, Italy, Monaco, Andorra and Spain. The United Kingdom is also connected by regular ferries across the North Sea and a train tunnel under it. Choose from a selection of ferry crossings, mini cruises, city breaks, themed cruises and holidays in Northern Europe and the Baltic. My favourite place for the French weather forecast is Meteo France. France Travel Guides - France Maps.